Asia in Today's World (ATW) is a Japanese language & Asian studies summer program in English for university students in any major. ATW was launched in 2001. Since its establishment, the program has been offering undergraduate level courses about the past, present and future of Asia and Japan. ATW is open to university students from all over the world, and around 40 participants gathered to ATW each year. For the last years, students have participated from many prestigious universities in the Asia-Pacific regions. You can see which universities they came from in the list below. Kyushu University, home to ATW, itself dates from 1911, when it was founded as one of Japan’s original seven imperial universities. It has grown considerably in its first 100 years and now includes 11 undergraduate schools, 18 graduate schools, four research institutes and a hospital. Total student enrollment currently exceeds 19,300, while instructional staff number over 2,000. 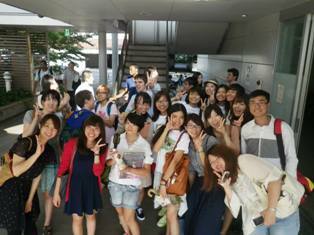 Some 2,100 international students from more than 80 countries are studying presently at Kyushu University. Kyushu University is located in Fukuoka, a pleasant coastal city of 1.5 million people and the largest metropolis on the island of Kyushu. Thanks to its favorable location close to China and Korea, the city has prospered as Japan’s gateway to continental Asia from ancient times. In light of Fukuoka’s special history and strategic position, Kyushu University has made a focus on Asia part of its educational mission. ASEAN in Today's World (AsTW), a two-week international program in ASEAN countries. Click the above logo for more info.